Ha, here is an article on a political blog that addresses "job training" and the animus against Mexico and China here in the USA. Yes, Gove moved out of the Department For Education and into the Ministry Of Justice which is the part of the civil service my workplace is part of. I haven't identified any changes ... yet! What happens after your GCSE? Are there apprenticeship programs for trades, or two-year programs similar to US community college? If you want to go to uni and can, how is that done? What are A-levels? If your situation is anything like ours, a high school diploma (similar to GCSE if I'm understanding properly) alone isn't going to get you much of a job, even from a good school much less a poor one. Snowflakey -- a huge problem, to me, with job training programs in the US is not just money spent on them, but availability and coordination. These programs are scattered all over the place, and whether or not one's available or you find it is pretty much down to luck. There needs to be a way to make them consistent and available, much less funded. State, federal, private, whatever, there needs to be something set up more cohesive and coherent than the patchwork random kaleidoscope we have now. Job training is a mess. :-( There seems to always be money to invest in prisons and war, but no money to invest in education. A-levels are the "advanced" qualification of the GCE. Taking A-levels (and doing well) qualifies you to go to University. At least that is my basic understanding of it. Yep you're right about GCSES, A - levels etc. I found studying four A - levels over two years more taxing than doing a three year bachelors degree. There are other routes to university, for example adult learners can sometimes be accepted based on their experience. The course I will be doing at Uni has an AAB A level requirement. At CEE I am miles away from the requirement. However, because I am 35 my A levels didn't count, and I needed 5 GCSEs C or above to secure my place (I have 5Bs and 5Cs). I have to complete a foundation year which is 1 years crash course to get me up to the same level as an 18yr old leaving school with good grades (and also up to date with modern science) then I can progress onto degree year one. Different universities have different requirements. I wouldn't have been considered for this degree when I was fresh from school. I couldn't even get onto a Biomed degree. Applied biology was the best I could hope for. Now, because I am "mature", I have opportunities available that weren't there 18 years ago. That is really great! I hope everything goes well in your program. Pretty interesting blog story about the future of Brexit. 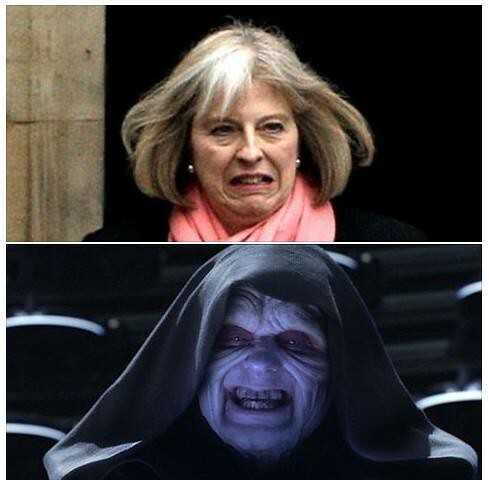 Theresa May will be PM. Does anyone need to adopt a 35 year old daughter with reasonable guinea pig knowledge? Preferably outside of the UK. Where TM cannot get me. Theresa May is PM. It's just been announced with immediate effect. There are more rumblings of a general election in the media. Well I suppose all we can do is see what happens. Oh no. The dark side has arrived. I fell out with TM years ago. Her comments over life tariffs hit a little too close to home, at a time when I was realising how short a sentence my Mum's killer had served and my head was not in a good place. She is the Emperor, in Cruella de Vil's shoes. How could the Tory party not come up with better candidates? TM and a religous nut who wanted to illegalise marriage for gays, straights, anyone not christian! Do you think there will be a GE? What would trigger it? What about a Brexit do-over? What are Corbyn's chances? Ouch! Guardian piece about the recent political bloodbaths in UK. Jessie -- we'll switch. One pretty old house that, uhm, needs some work but solidly built. Several reasonably priced (relatively speaking) colleges nearby. My husband and I go to the land of constant rain and clouds and TM, as long as I can visit Richard III's spot in the car park. I can **certainly** understand your feelings toward May. You deserve an enormous amount of credit for becoming the person you have become. I'll say no more than that, but you have my utmost admiration and respect. From what you all are saying even Gove would have been better. Gove is a Pob/ventriloquists dummy hybrid, and his Daily Mail columnist spouse is the puppeteer. I'm pretty dismayed with this week's developments so far. Angela Eagle has launched her challenge for Labour leadership though she's pro - trident, pro-airstrike, and voted for the Iraq war. If JC goes things will feel pretty hopeless. Alas, you may want to be a'courtin Evangeline (Canada) instead of some of us statesers.